With the Wi-Fi mesh system craze now in full swing, you have plenty of options when looking to wrap your entire home in wireless Internet access. Whether it’s versatility or power you desire, there’s a wireless mesh for you, with the Eero Home Wi-Fi System focused on the power end of that equation. Read our Eero Home Wifi System Review. The Eero Home Wi-Fi System works in much the same way as any other wireless mesh system, but uses a tri-band network that broadcasts its router signal to beacons. This enables the system to use the full breadth of the 2.4GHz and 5GHz bands, leading to better throughput for connected devices. However, is that worth the luxury-level price that the Eero goes for? That entirely depends on your needs, since this is a fantastic wireless mesh system with deep control and impressive performance that may actually be more than enough for you. 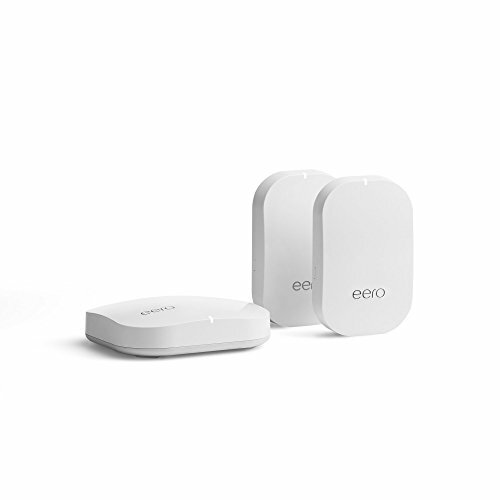 The Eero Home Wi-Fi System remains one of the more expensive wireless mesh options for one Eero router and two beacon units in one package. That setup will cover up to 914.4 square metres of home space. Comparatively, Google Wifi for three units that cover up to 1,371.6 square metres, though not through a tri-band network. The Netgear Orbi system uses a tri-band network to connect two units, covering up to 1,524 square metres. 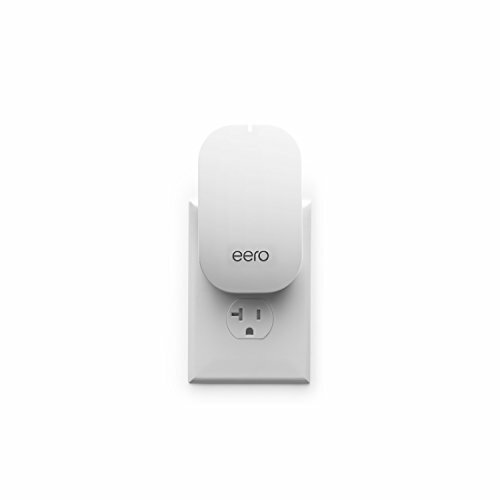 Eero’s system fits between these two options, offering a tri-band network with the same amount of units as Google Wifi, meaning more 2.4GHz and 5GHz bandwidth, yet within a smaller space by 457 square metres. On the other hand, Netgear Orbi has fewer connection points at the base price, but purportedly covers more area with a similar tri-band network. 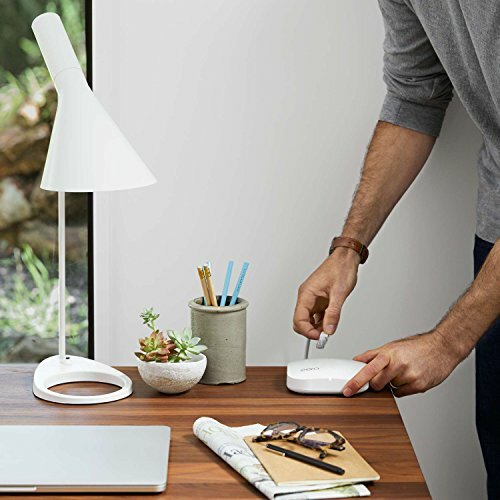 If you’re familiar with Wi-Fi mesh systems, then the Eero design will be nothing new to you. The base router unit looks like a white, glossy, plastic puck with two Ethernet ports on its backside. The two satellite, or Beacon, units plug directly into your outlets, like gigantic Glade Plug-ins. These white Beacons feature nightlight options that can be controlled in the Eero app settings, a welcome touch that few – if any – competitors offer. This design reduces the system’s versatility in that only one unit can be the router, and no Beacons can share hardwired Internet with nearby devices, like Google Wifi can. However, the trade-off is hardware that more easily disappears into the home than any other we’ve tested. 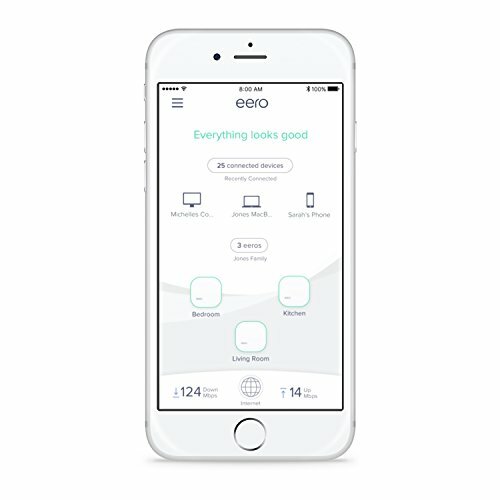 Setup is just as easy as all of the other Wi-Fi mesh systems, using a free Eero app for iOS and Android devices. Just install the router, update its firmware, give it a name and password – and you’re good. Then, adding a Beacon is just as simple, and you can add more than the box includes, should you need to expand your network later. The app offers fine control over the network and the devices connected to it, including a built-in speed test and guest user controls. You can also create family profiles with parental controls, and subscribe to security service Eero Plus. This service offers enterprise- grade network security, powered by Artificial Intelligence (AI) that detects threats based on normal browsing habits and traffic sources. Included in the service, too, are subscriptions to Encrypt.me VPN, 1Password and Malwarebytes. 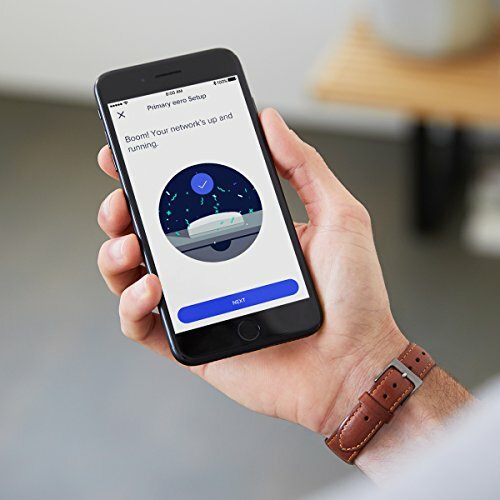 The Eero Labs portion of the app enables you to activate features that are still in testing, like band steering, which pulls devices that are able, into the 5GHz band more often, based on their usage history and location data within the home. 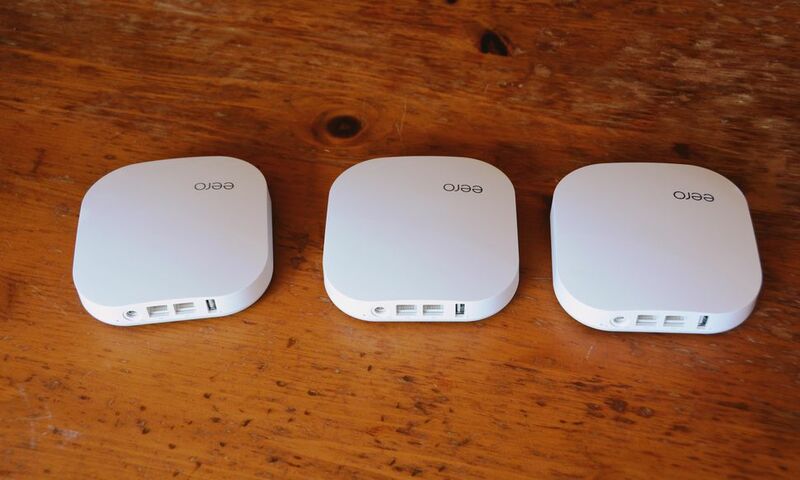 All told, Eero is the most deeply customisable and tweakable Wi-Fi mesh system we’ve seen. 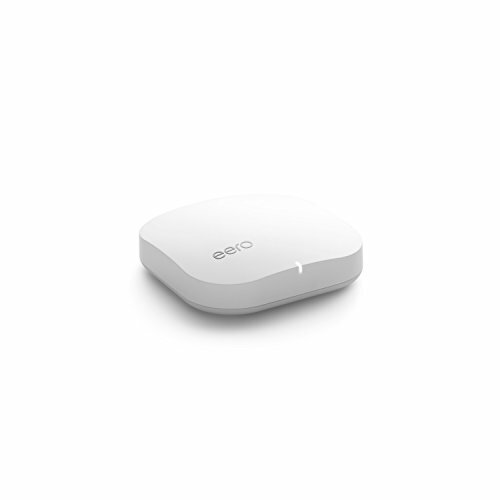 If you wants deep control of your network without the fuss, then Eero comes highly recommended. The Eero Home Wi-Fi System held up very well in our exhaustive tests, showing off signal strength that dulls very little through standard plaster walls. It’s also clear from our tests that the system delivers stronger output than that of Google Wifi, which doesn’t quite handle walls as well. 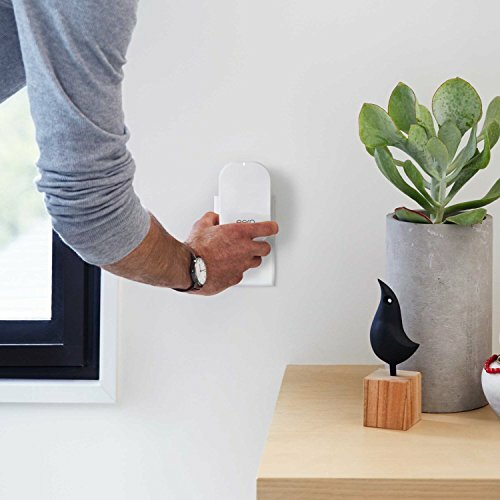 Like the Netgear Orbi, the Eero system further mitigates these interruptions with two Beacon units connected via a third band of data transfer transmitting at 5.8GHz. That’s done separately from the normal 2.4GHz and 5GHz bands that your other devices connect to, thus freeing up bandwidth for more devices or for more data- related tasks. This choice of the 5.8GHz band, rather than just throwing out another 5GHz band, like the Netgear Orbi does, was almost certainly a conscious decision. It’s possible that this small deviation on the frequency could provide a slightly less crowded signal on which the router can share its Internet connection with the Beacon satellites. At any rate, we found the Eero completely capable of taking full advantage of our 100Mbps connection at home. That, coupled with the fine control that the Eero mobile app provides, has made for a reliable, admirable performance. The Eero Home Wi-Fi System is the most expensive of its kind on the market. However, its creators have taken great pains to make that entry price worthwhile, and it shows in the product. That said, it’s tough to see us getting that much more out of this mesh system over others that cost far less. For instance, there isn’t much more that the Eero can do that a Google Wifi network cannot, beyond power user features that can end up just costing more money. New, experimental features like band steering might wow a certain kind of user, but we’re not sure that’s worth the inflated price. This is especially true when you begin to consider that the basic Eero system covers 450 fewer square metres than most rival systems, including Google Wifi. 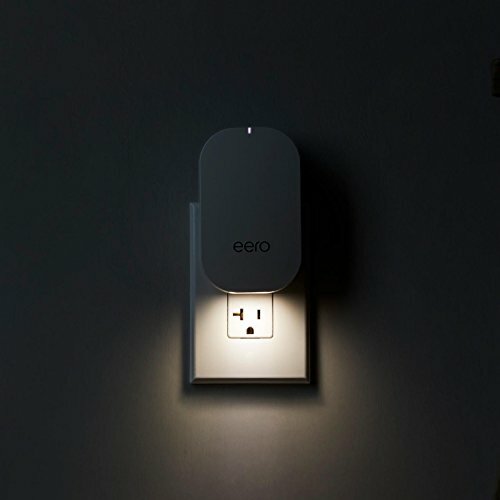 Ultimately, Eero stands to be the premiere Wi-Fi mesh system for the tech enthusiast who wants the absolute most control over their network both from a performance and security standpoint. Just be sure whether you truly need or desire that level of power and control before you click that Buy button, knowing that somewhat more basic models offer much of the same (or more) for less. Smart, slick and powerful, the Eero is the best Wi-Fi mesh system yet - but it comes at a high price.